(CNSNews.com) - The unemployment rates dropped in 2017 for workers 25 and older of all educational levels, according to data released today by the Bureau of Labor Statistics. Among high school graduates who never attended college and who are 25 and older it hit a ten-year low of 4.2 percent in December, according to the data. The unemployment rate among this group was never that low during the two-term presidency of Barack Obama. The last time unemployment among high school graduates who never attended college was lower than 4.2 percent was June 2007, when George W. Bush was president. That month it hit 4.1 percent. But in July 2007, it rose to 4.6 percent; and by the time Bush left office in January 2009, it had risen to 8.2 percent. During Obama’s presidency, the lowest the unemployment rate for high school graduates who never attended college was 4.9 percent—the level it hit in November 2016. In January 2017, the month Obama was succeeded in the presidency by Donald Trump, the unemployment rate among this group was 5.2 percent. Since then, it has dropped a full percentage point. According to the data published by the BLS, the current unemployment rate declines as the educational attainment of the worker goes up. Among people 25 and older who did not graduate from high school, the unemployment rate was 6.3 percent this December (down from 7.6 percent in December 2016). Among those with a high school diploma but no college, the unemployment rate was 4.2 percent this December (down from 5.1 percent in December 2016). Among those with some college or an associate’s degree, the unemployment rate was 3.6 percent this December (down from 3.8 percent in December 2016). Among those with a bachelor’s degree or higher, the unemployment rate was 2.1 percent this December (down from 2.5 percent in December 2016). 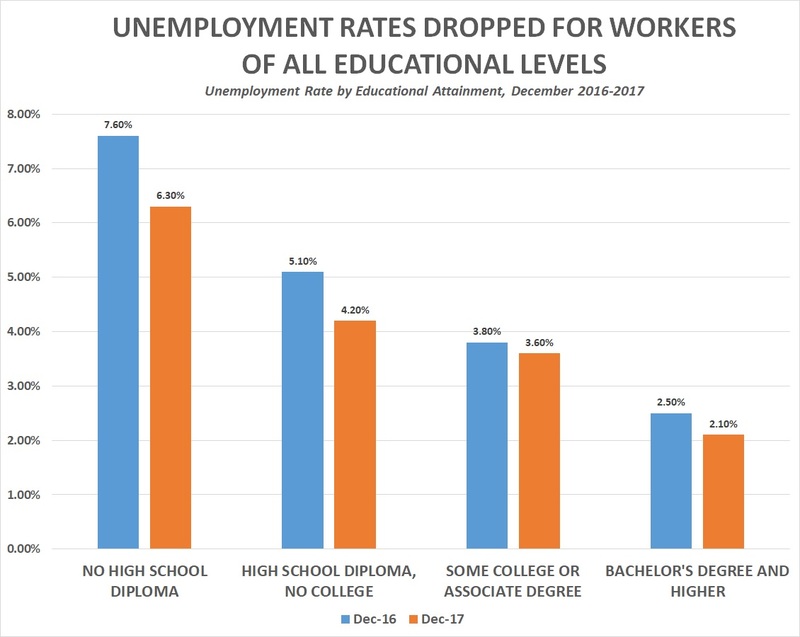 While the unemployment rate has dropped over the past year for workers in each of these educational levels, proportionately it has dropped the most for workers with a high school diploma but no college. The unemployment rate for that group of workers dropped 17.6 percent (from 5.1 to 4.2). That compared to 17.1 percent (7.6 to 6.3) for those without a high school diploma; 16.0 percent (2.5 to 2.1) for those with a bachelor’s degree or higher, and 5.3 percent (3.8 to 3.6) for those with some college or an associate’s degree. The civilian labor force of people 25 and older who had a high school diploma but no college climbed from 35,535,000 in December 2016 to 35,760,000 in December 2017—an increase of 225,000. But the number of employed people 25 and older who had a high school diploma but no college increased even more. It climbed from 33,874,000 in December 2016 to 34,425,000 in December 2017—an increase of 551,000. The number of unemployed people 25 and older who had a high school diploma but no college decreased by 305,000—dropping from 1,808,000 in December 2016 to 1,503,000 in December 2017. Someone is defined as being in the civilian labor force if they either had a job or was actively seeking one in the month in question.